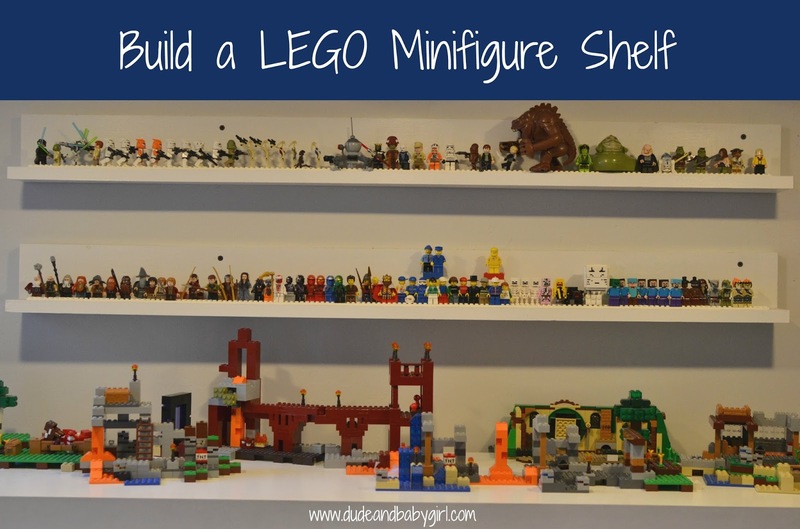 Do you have a child with a multitude of Lego Minifigures? I never realized how many my children have until we tried to find them all. We have Way Too Many. We have full Minifigures, random Minifig pieces, and pieces that I don't know what they are. I'm the kind of person who likes to have things organized and in their own places, but that hope never really materializes. In order to corral and display the many Minifigures my son has, I re-purposed some shelves for him. I originally built some photo shelves (picture ledges? frame holders?) that were up in our old guest room/office/bonus room. When the room was converted to a school room, the shelves came down and got stored in the garage. 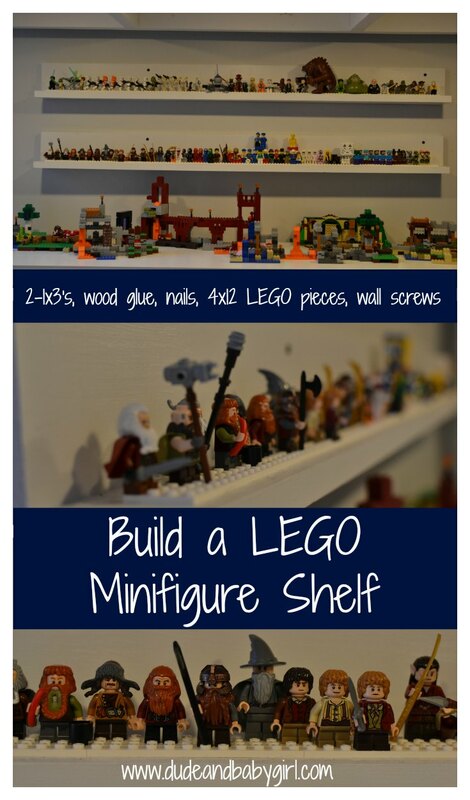 One day I was frustrated with the Lego mess in my son's room and decided to put those picture shelves to another use. I measured them and found out they would easily hold some 4x12 Lego pieces. I ordered some at Lego.com and when they arrived I hot glued them to the shelves. We installed the shelves above the "Lego shelf" in my son's room and he neatly arranged the Minifigures for display and use. The neatness probably lasted about 14 hours. I had him reorganize the shelves to take the photos. I guess that is one way to get him to clean up. About 80% of the time, nearly 3/4 of the Minifigures are on his floor. I'm not kidding. It drives me nuts. I want all the Minifigures displayed on the shelf and all his sets neatly arranged on his Lego shelf, but my child doesn't think like that. He prefers millions of Lego scattered on his floor so that he can mix and match and build to his heart's desire. I have to take deep breaths when I enter his room, but he does make up some fantastic creations. How do you organize Lego stuff? And do your kids keep it organized?